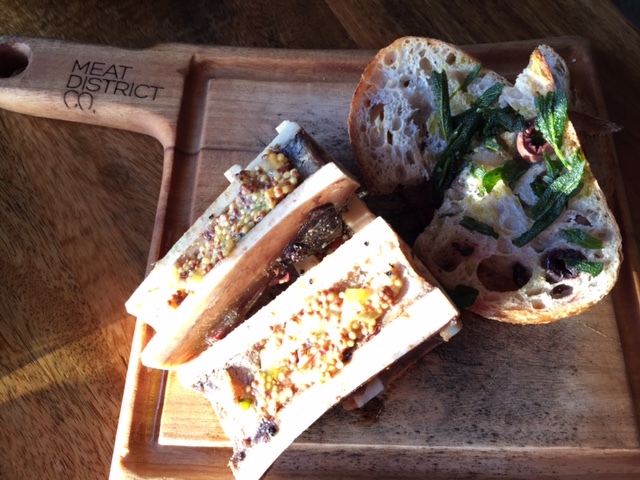 Sydney does so many things well when it comes to spoiling locals and tourists with top places to feast. Like restaurants with glorious water views. And menus that showcase the best local produce. Affordable food prices that allow you to justify becoming a regular. And drinks lists that hero Australian wines and craft beers. But it’s rare that you get all of these packaged into one place – compromises are usually needed. So I was easily tempted into trying Meat District Co. – on paper it seemed to tick all of these boxes. 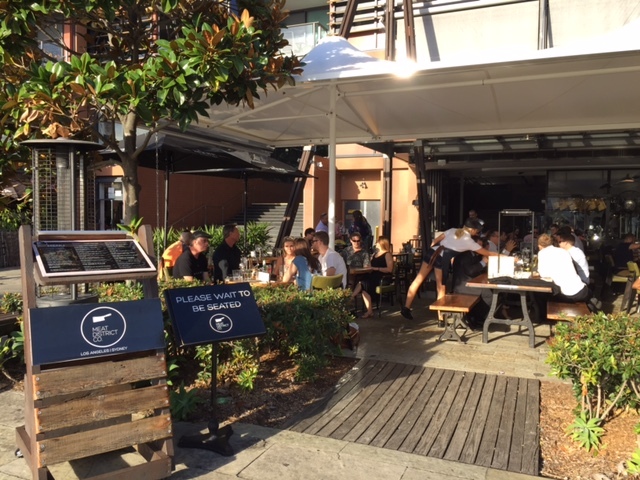 The restaurant opened in late 2014 on King Street Wharf and is sister to a slightly older branch of Meat District Co. in Los Angeles. Water view? Yes – its split level location on King Street Wharf offers views of Darling Harbour from both floors. Sit alfresco on the ground floor and watch the boats come and go. Or take the spiral staircase to the upper floor and grab a table by the window. Good produce? Indeed – the ‘paddock to plate’ inspired menu is grounded in their philosophy of sourcing ingredients in partnership with sustainable Australian producers. 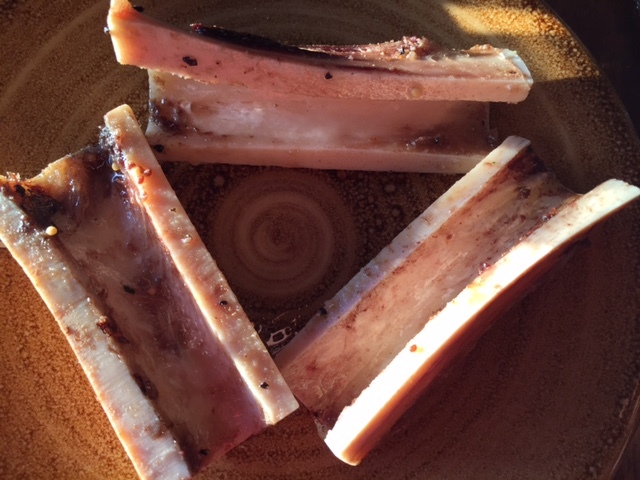 I’m talking grass-fed Cape Grim beef from Tasmania, house made sauces and more. Affordable prices? Yes – with salads less than $10 and burgers from $12 you’ll hardly think about the bill, and you certainly won’t walk away hungry. Even the wine list is capped at $60 and cocktails start at $10. And the drinks? The short Australian focused wine list makes a refreshing change from having to review pages of wine options. There’s also a long cocktail list to choose from. 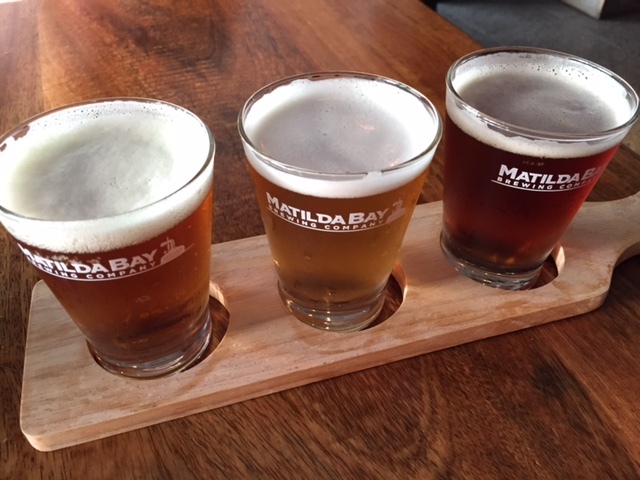 Beer drinkers are well catered for too – with tasting paddles and more….. So what’s the catch? There isn’t one. Even the interior is no expense spared ‘rustic old-school’ and you can make reservations (hooray no queues!). They also have an enthusiastic team on board – I found the service to be quick, friendly and consistent. The menu is long and varied – from starters and salads, to burgers, to grilled items and not forgetting ribs & combos. You really want to try everything so go with an empty stomach – these are man-sized portions. Check out the menu items I enjoyed here. 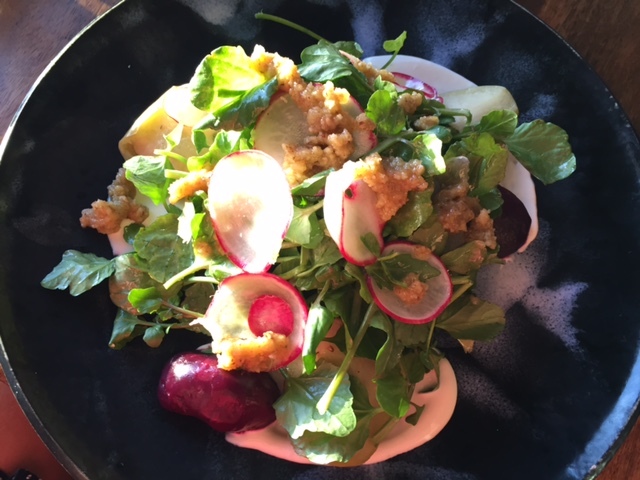 With all of the meat on the menu I was keen to see if the chefs gives as much love to the vegetarian dishes – so I tried the beet salad. The portion size is exceptional value for $9.50, in fact I’ve paid $20 for similar salads elsewhere. Vegetarians aren’t limited to salads though – there’s also a not-your-ordinary vegetarian burger available – the patty is made up of root vegetables with oats, almonds, sunflower & pumpkin seeds and comes served with mushrooms, greens & hommus. Of course the burgers came next…. Choosing which of the 10+ burgers to try was a very difficult decision – the truffle burger almost tempted me, as did the spider crab burger. With prices between $12 and $16 it’s hard to go wrong. 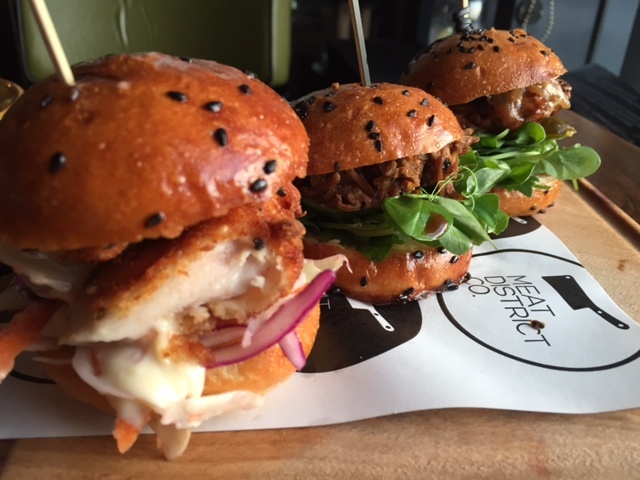 In the end it seemed more sensible to go for the slider flight so I could compare three different burgers. They were all so good I’d return for a full-sized version. 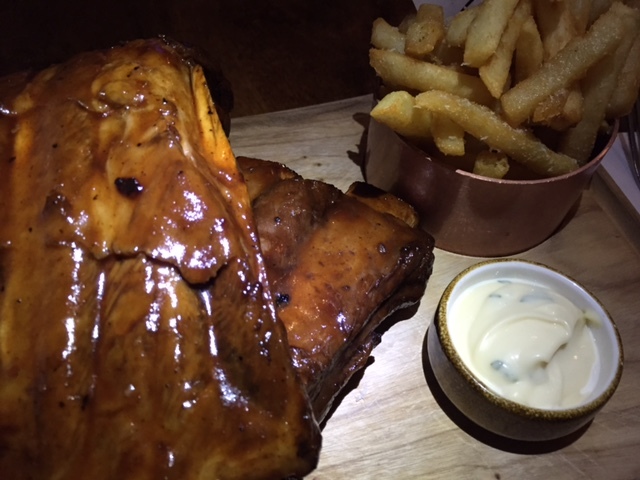 The ribs come served in two sizes (full rack or half rack) with your choice of fries or a side salad. You can choose beef only or pork only or a combination of the two. When it comes to ribs some restaurants use too much sugar in the marinade to compensate for average quality meat. 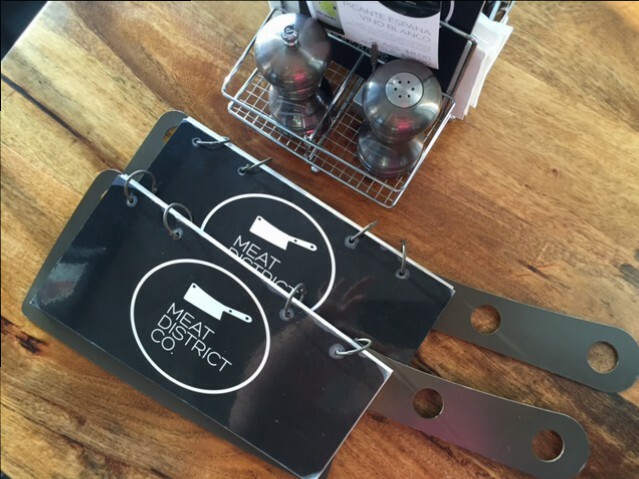 But not at Meat District Co. – the beef comes from happy grass-fed cows and the marinade is tasty without being too sweet. The slow cooked meat is tender and yes it’s also very messy – but wear a bib and you’ll happily get stuck in with your hands. 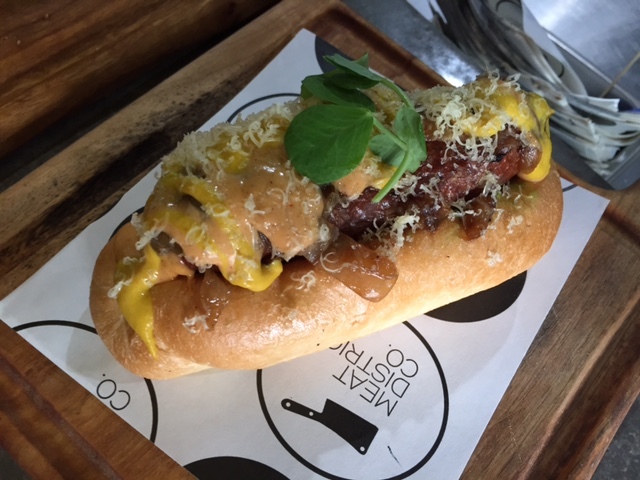 Also on the menu are two types of hot dogs – the Classic Dog and the Street Dog – now I can’t give a verdict on either – I quickly grabbed a photo of the Classic Dog as it was waiting on the pass. Visit between the 3 – 6pm daily for $5 Happy Hour drinks (wine and beer). There’s a kids menu on offer for the little ones – and of course it features burgers. 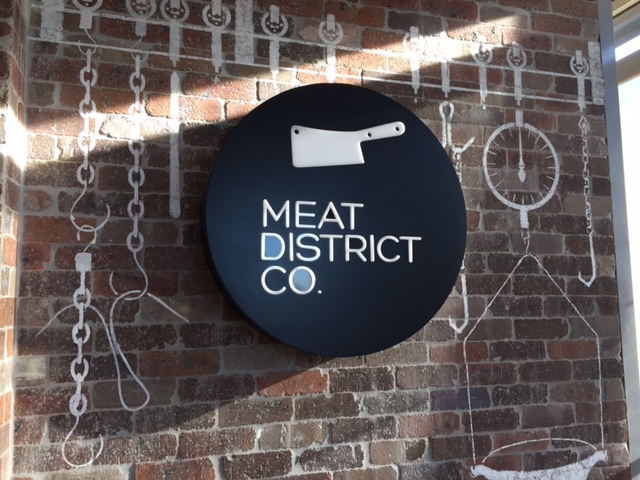 DJs keep Meat District Co. lively on weekends (from 8pm on Friday and Saturday). 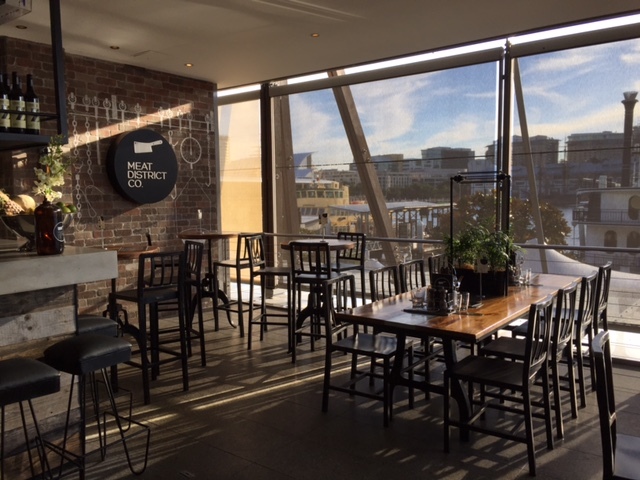 It’s a good spot for functions – with value for money set menus and beverage packages. 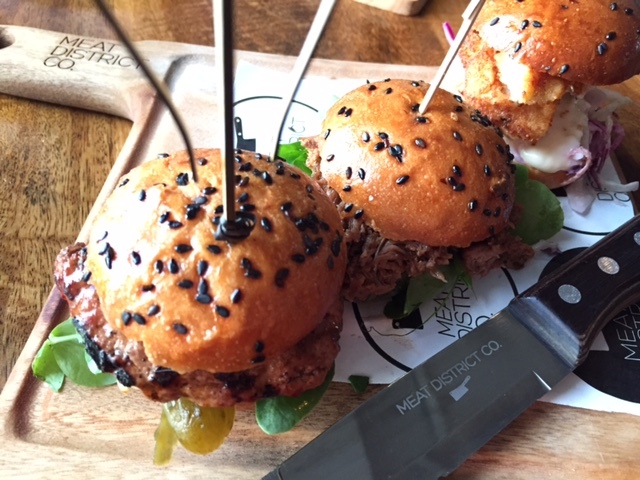 Tags: burgers, Meat District Co, menu, reviews, Sydney. Bookmark the permalink. Previous post ← How much sugar is in fruit? Great review, FW. Bookmarked for after a few more reintros! Why thanks TSL (can’t seem to find your name) – it’s defo worth a visit especially if you love good meat! Yes I know! It’s so good…..